I have a theory about animated films aimed towards children that are headlined by The Weinstein Company. And, The Nut Job gives me more material to work with. The Nut Job further solidifies my opinion that: the Weinsteins are severely out of touch with the youth of today, they think your children are dolts who will lap up anything animated, and they think you – the parent – are nothing more than a money tree who will have to shell out moolah in order to keep your kids happy. It’ll sound like I’m being cynical on something that should be deemed as innocent child fare, but I’ve had enough. I didn’t have to sit through TWC’s Doogal or Hoodwinked Too! Hood vs. Evil, but I chose to. I’m always curious about the current state of children’s entertainment. The results I’ve seen from TWC have me dismayed and disappointedly shaking my head. Their latest debacle The Nut Job did nothing more than shovel coal onto an already fuming fire. Peter Lepeniotis has directorial experience with animated shorts, but The Nut Job marks his first solo adventure to the big screen. With The Nut Job, he’s building off of a 2005 short titled Surly Squirrel. In this bigger version, Surly (voiced by Will Arnett) is trying to forage for the winter against a park full of critters. His selfishness blinds him from everything, including our strong unlikable feelings towards our unlikely and heavily snarky hero. The park critters don’t want any trouble. They are just as desperate, and want to scrounge up enough food to fill a very big tree. Surly rustles some feathers and after an obnoxious action piece, the plans for both the greedy squirrel and the park go – literally – up in smoke. Meanwhile, a group of human thugs are planning to rob a bank. In order to set up shop unnoticed, the gang stakes out across the street at a nut emporium. Surly, however, thinks the nut business is for real. Over the course of the movie, we watch these two labourious heists pan out. The animation and the story in The Nut Job have an oil-and-water chemistry. The visuals look slashed down and crude, but also have minor potential to work. The lethargic story, however, yammers for far too long for a film aimed to a young demographic with a short attention span. 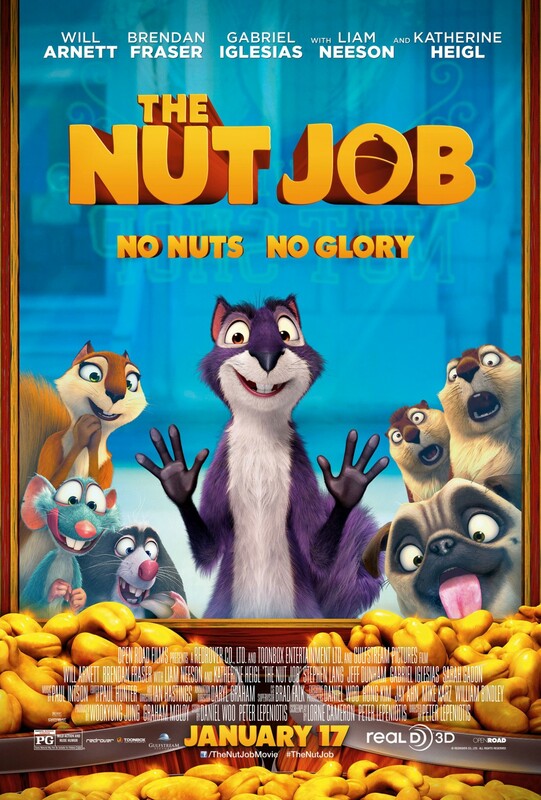 The Nut Job wants to move at an accelerated pace, but is held back by very boring robbery plots and flat banter. Lepeniotis (along with co-writer Lorne Cameron) spend way too much time with the bland humans, yet somehow these characters are the most underdeveloped. They aren’t intimidating or threatening. They’re just outlines of what a crook would look and sound like in a mob movie. It’s also important to note that The Nut Job inexplicably takes place in the late 50’s, and never calls attention to it. You’re supposed to accept that there’s a purpose for this change in setting, but this could have just as easily taken place during the present year. The period attributes don’t add anything to the film and rather feel like the animators are taking a lazy way out. Instead of detailing their animation to represent modern times, they create a broad design that uses the shapes of old props and costuming. Lepeniotis also has no problem using overplayed music tracks like Gagnam Style and even has an animated Psy make a dancing appearance during the end credits of the movie – a movie that, again, takes place in the 50’s! This means he manifests another oil-and-water scenario with current trends clashing with dated drabness. Worst of all is that The Nut Job blatantly and shamelessly rips off better, more heartfelt animated films – most notably the surprising hit Over the Hedge and the works of Pixar. The film’s clueless comical dog is similar to Up’s Dug, except Dug was more charming and The Nut Job’s Precious is aggravating. The critters in The Nut Job all have a Ratatouille vibe to their design, and even the film’s climactic confrontation is straight out of Toy Story right down to the on-the-road setting. 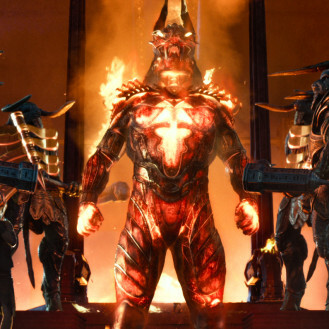 By the time you’ve heard the umpteenth nut pun during a continuous strand of terribly written comic relief voiced by an even more irritating Brendan Fraser, you’re just about ready to go nuts.